When I saw Marionberry’s trend of the month link up was yellow, I had an outfit in mind that I would wear and post. Somehow, the yellow top that I had in mind can’t be found anywhere. Gremlins, anyone? My only other yellow top was the DvF for Gap Kids printed top, so I tried to make that work appropriate by layering that under my new tweed jacket. I felt something was amiss still and decided to layer yet another blouse underneath the yellow top. In my experiments with mixing prints and patterns, I’ve come to realize that polka dots works as a great neutral, so here’s my second outfit featuring polka dots and print! (the first was here.) You can check out the other yellow outfits from the link up here. 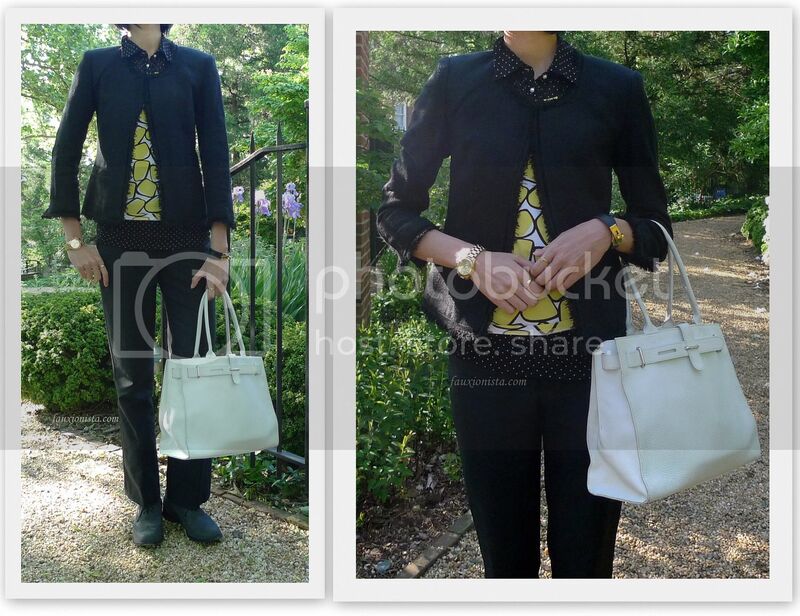 This entry was posted in Fashion, Outfit and tagged Banana Republic, black, Cartier, Cole Haan, DvF, Fang Fong Projects, GAP, Hermes, Kelly Double Tour, polka dot, yellow on May 15, 2013 by fauxionista. I stumbled across your blog via Marion’s link-up and totally agree that polka dots serve as a neutral, but love the extra interest they give to an outfit. If you have a moment, I’d love to hear what you think of my take on this month’s yellow trend! http://wp.me/p1MyN3-1IY Have a great Wednesday! love the yellow blouse under the all black! super cute! Thank you! I think the yellow makes it a little more cheery!